The answer is yes, but there are some limitations. 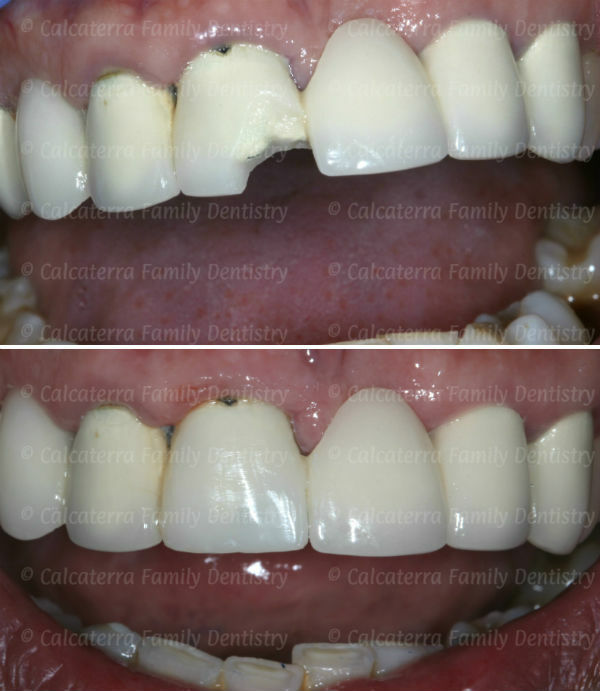 But let’s first look at a successful porcelain repair case we completed in our office. The photo below shows a patient of ours. He had a 7 unit dental bridge that he loved – and that had been in his mouth for over twenty years. An unfortunate slip in the bathroom led to him banging his tooth on a porcelain sink (notice the irony?) which led him to fracture off a huge chunk of the ceramic on his front tooth. The porcelain chip was large, unsightly, and very noticeable. His greatest fear was that we would have to do a brand new bridge. In Round 1, in Dental Bridge vs. Sink, the Sink won. In Round 2, Dr. Nick emerges victoriously over the Sink and saves his patient’s bridge! Photos and dentistry by Dr. Nicholas Calcaterra. We utilized the highest rated porcelain repair kit on the market. Leveraging this product, along with our expertise, we produced a phenomenal result. It took us approximately 1 hour. And the best part is that our patient did not need a new bridge. If you noticed from the beginning of this post, we said that we could repair porcelain, but there were exceptions. Cosmetic porcelain crowns, bridges, and veneers are made in a variety of ways. But nearly every method requires the porcelain to go to extremely high temperatures – like over 1,000 degrees Fahrenheit! So to add porcelain to a crown in a predictable manner, you would need to put the crown into the firing oven. But that’s not possible given that there’s a person connected to the tooth! His bridge was cemented in placed. So we bonded composite on there. Two years later, he still looks great! Repairing porcelain is not an every day procedure for most dentists. So, many dentists simply do not know how to do it. A dentist has to keep in stock a very specific (and expensive) porcelain repair kit. Most dentists don’t have this in stock. Some larger fractures can be impossible to repair in a manner that lasts a while. In those cases, you may need to invest in a new crown, bridge, or veneer. If you believe this is what you need, it never hurts to call and ask the dental office if they are able to do this type of procedure. 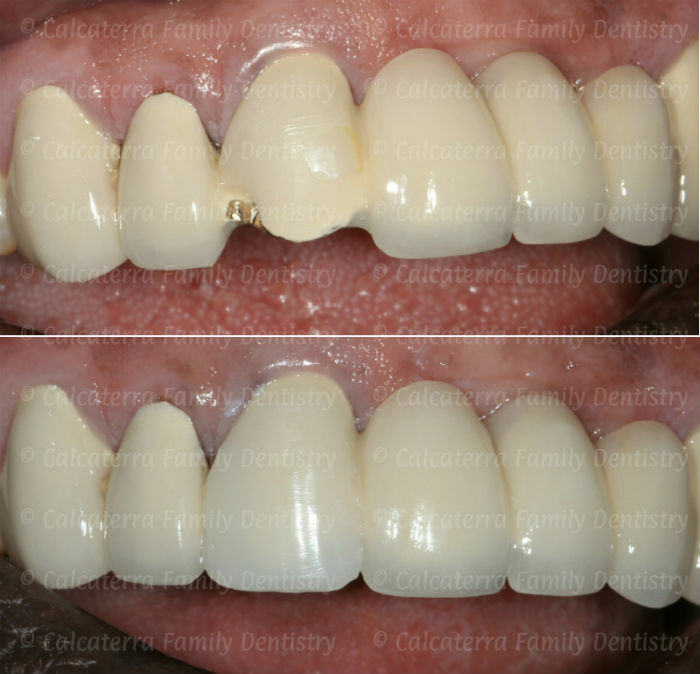 Do you have a crown or veneer that is chipped? Interested in seeing if it can be repaired? Call us at (203) 799 – 2929 or visit this page to request an appointment.